For day ten my next theme victim, Aday, gave me the neat little topic An Icy Place. That sounds like fun! Let’s see where we go…. Wind that cuts like ice. J R Manawa. Outside the storm continued to rage as the black cab wound its way through the streets of North London. Inside the cab, Emmeline was silent. She was chewing over the million and one thoughts that were racing around her head. What appointment was she being taken to? What did he mean by minotaurs, vampires and pixies? What did he mean by only letting a few through the gate? What was the job the man in the tall hat was supposed to complete? What had he done to her grandfather? And then there was her captor, the gunman, hostage taker, face-remover, tree-shifter. The bad guy with a storm in his eyes. He was a monster, but he seemed to think she was something worse than a monster. She still remembered his words in the elevator when they first met, ‘We all just want to go home, and every time you just don’t get it.’ And his name, he said his name was ‘Charon’ but that was her name, her family name given to her by her father. Across from her Charon sat silently, ignorant to the thoughts raging inside his captive’s mind. He had one leg up on the chair in front of him, resting his arm across his knee and staring out the window at the passing world. He had let go of her arm, because she couldn’t escape from a moving cab anyway. “Charon,” Emmeline said, breaking the silence. “Why do we have the same name?” She didn’t really know why this was the first question she asked, or why she assumed he would know the answer. She wasn’t sure if he was being sarcastic, or if he was actually sharing with her, and it annoyed her, so instead she asked her next question. “So if fairies and minotaurs exist, what does that make you?” she was painfully aware of how ridiculous the question sounded as soon as it left her lips. “The gatekeeper,” he said simply. “I remember being told about the tooth fairy,” she said, and this time it was her who was definitely practicing sarcasm. “That somewhere being the imagination,” she suggested, with raised eyebrows. She shied away from the mirror. “I don’t know that makes any sense,” Emmeline said warily, as the mirror turned into a gun in his hands. She stiffened and tried the door handle as discreetly as she could, but it was locked. “See?” He set the gun spinning in his open palm, then he held both hands up and the gun was gone. At that moment the cab pulled up in front of a high iron gate. Emmeline wasn’t sure, but she believed they were up at the top of Hampstead Heath somewhere, near Highgate. The gates before them opened automatically, and the driver shifted the car out of neutral, but Charon put his hand up for him to stop. “It’s fine my friend, we will get out here,” he said in a cold, steely voice. He lifted his hand to the door, and the locks popped up instantly. Emmeline didn’t even ask if he was going to pay the driver, she followed Charon out of the cab and watched meekly as it drove away. “Where are we?” she said. The rain was gone, but the wind up this high near the open heath was glacial. The cold was biting through the jacket she wore. She shivered as Charon took her by the arm again. “Come on,” he said, his voice weary now. They walked the rest of the way up the drive in silence, the noise of the wind too loud to be heard above. Emmeline was sure the further up the driveway they went, the colder it was getting. She was shivering through her winter jacket, and her teeth had begun to chatter before the house even came into sight above the trees that lined their path. The house was big and old, fashioned of grey stone with a Grecian façade. The lawns around it were barren and empty from the winter, and from the branches of trees closest to it, Emmeline could see Icicles hanging. 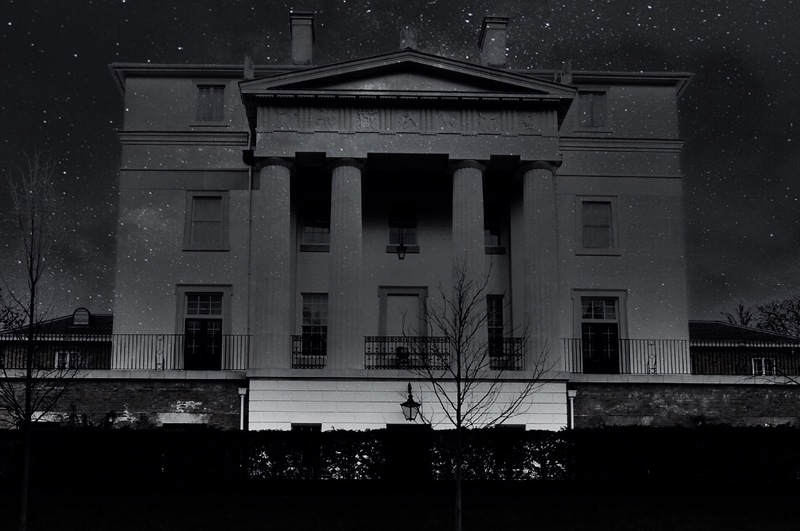 Within the house itself, there was neither a light nor sign of life to be seen. As they came into the shadow of the mansion, Emmeline clutched her freezing arms to her sides, and touched Charon’s hand in the process. It was cold and smooth, but he let go quickly at her touch, and put his hand on her shoulder to guide her instead. Once they had climbed the steps to the front door, Emmeline turned to him, “Charon, is my grandfather dead?” she asked, intending to catch him off guard. He ignored her. “Here is where our journey ends,” he said. “Of course, this has nothing to do with me.” He said, rather vehemently, but the door of the mansion opened as he turned to leave. From beyond the door a billowing, icy wind escaped, and it cut straight through Emmeline, chilling her to her bones. She gasped, and Charon stopped in his departure. Thank you, Im having so much fun writing it!